Officials from the Chicago Housing Authority have been under fire recently for proposing to drug test all tenants. But for over a year, CHA pushed a new policy that would have required tenants to turn over their children’s report cards and other school information as a condition for remaining in public housing. CHA’s proposal was fiercely resisted by the tenants’ representatives and their lawyers, and the CHA eventually backed down. “This is appalling, and is not, and never has been authorized by Federal statute, or the regulations issued by the United States Department of Housing and Urban Development (HUD); nor is it contained as an exception in the CHA’s Moving to Work (MTW) Agreement,” declared Robert Whitfield, the attorney for the Central Advisory Council, the elected leaders of CHA tenants, in one of the back and forth emails to CHA General Counsel Scott Ammarell on December 8, 2010, which Residents’ Journal obtained from Whitfield. Terry Peterson was the head of the Chicago Housing Authority until earlier this year. Now he is the manager of Mayor Richard M. Daley’s campaign for reelection. But in the months preceding Peterson’s departure from the helm of the CHA, a ward organization closely linked to him saw a sharp drop in contributions. The 17th Ward Democratic Organization took in just $12,000 in itemized contributions in the first six months of 2006, according to records filed with the Illinois Board of Election Commissioners. For years, the resident leaders of the South Side CHA Bridgeport Homes public housing complex said that Legum and Norman, the private property management firm for the public housing site, were poor managers. The resident representatives at the complex often reported to the CHA officials the concerns and problems they were experiencing with the management company. Residents’ complaints range from long-standing work orders that were not addressed, to poor roofing work done in a rows of units housing seniors during the winter, to allegations of mismanagement of public funds by former property managers of the company, to one manager’s alleged violation of federal rules by granting a prison inmate permission to live with his sister at the CHA site currently under rehabilitation. Because of the residents’ continued complaints about the private property management company, Legum and Norman, a Virginia based company, also came under scrutiny for their campaign donations. Legum and Norman’s only business interests in Illinois seem to be in Chicago and the company made their only political donations in Illinois to the 17th Ward Democratic Organization, where there is no public housing or redevelopment activity. “A Questionable Connection,” an investigation done by Residents’ Journal in collaboration with the Better Government Association and published in the last issue, detailed an analysis of the Illinois State Campaign Contribution Disclosure Forms and CHA contract agreements which showed that Legum and Norman gave before and after receiving contracts from the CHA. But they made no campaign donations to any other wards since working in Chicago. The 17th Ward is currently home to CHA CEO Terry Peterson, who was also the former alderman of the ward. Current 17th Ward Alderman Latasha Thomas confirmed in “A Questionable Connection” that Peterson remains actively involved in 17th Ward affairs. Like Floyd, many men and women who join street gangs at an early age find themselves feeling like small fish swimming in deep, shark-infested waters. Once they take the bait—usually the money, fancy clothes and flashy cars that gang leaders have—they are hooked and stuck for years. When Francine Washington noticed hordes of police officers outside U.S.
Cellular Field this spring, she walked toward the ballpark and counted them. The stadium, home of the Chicago White Sox, sits about three blocks west of the Stateway Gardens public housing development where she lives with her husband of 23 years. 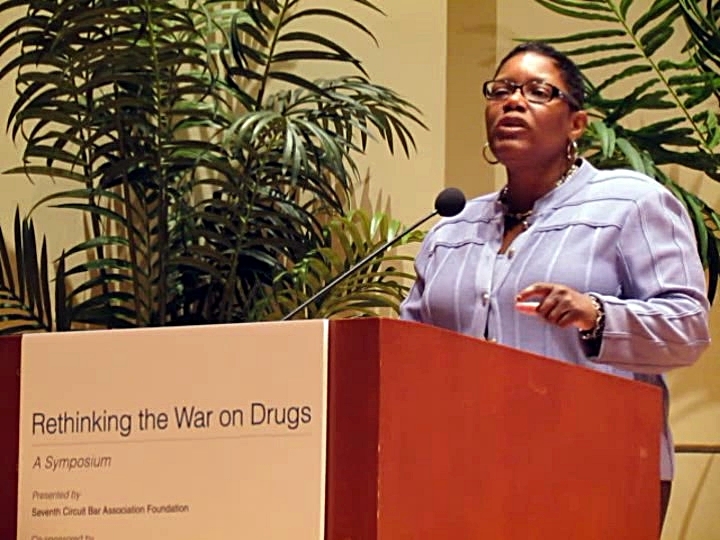 For years, Francine Washington complained about open drug dealing in the first-floor lobby of the Stateway Garden high-rise where she lives. Only recently have routine police patrols in the building slowed the drug activity. “I went out there twice. The first time I counted 105 police officers out there. The next time I counted 107 officers,” said Washington, president of Stateway’s local advisory council, an elected tenant body. While Mayor Richard M. Daley is touting his plans to remake Chicago Housing Authority developments into mixed-income neighborhoods, a firm that manages one of his showcase communities is charging that the city is not doing enough to stop open drug dealing on its site. The city has a lot riding on the Near West Side’s Westhaven Park. A failure to attract market-rate renters and buyers could set a bad precedent for other public housing redevelopment efforts. Nicole Wright thought her new home in Englewood would be safer than the Robert Taylor Homes. Last fall, her family was displaced from the dilapidated high-rise at 4037 S. Federal St., one of dozens demolished under the Chicago Housing Authority’s Plan for Transformation. Her new neighborhood is filled with blocks where trees shade homes with big porches, and neighbors sit out and enjoy the pleasant weather. But this area is also plagued by drugs and gang violence. Like many relocated out of public housing developments, Wright had a teenage son, Kemp, 16. Teenagers can be dangerous for families leaving public housing, even if they are not members of a street gang. And gang members in Englewood looked upon the Wright family with suspicion. A plan intended to transform the lives of public housing residents has also transformed the city’s illegal drug market — often with deadly results. The stories in this issue document that connection. They are the products of a year-long partnership between the Residents’ Journal and The Chicago Reporter, a 32-year-old investigative magazine which keeps leaders and concerned citizens informed about the ways race and poverty shape our region’s key issues.